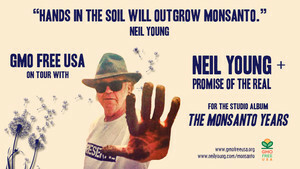 UNIONVILLE, CT, Sep. 29 /CSRwire/ - On the heels of a successful July tour, GMO Free USA will again be joining Neil Young + Promise of the Real for their October #RebelContentTour promoting the new studio album, The Monsanto Years. The tour kicks off October 1st in Missoula, Montana, and wraps October 17th in Berkeley, California. Neil Young’s “Activist Village” - a coalition of leading national nonprofits - will be traveling with the band, raising awareness and educating concertgoers about industrial agriculture, environmental issues, and the negative impact of corporate control of government. GMO Free USA will be hosting the GMO education tent, while Move to Amend, Center for Biological Diversity, CSG (formerly The California Grange), and Earth Island Journal will host tents under their respective issue areas. The five host organizations will be bringing in local nonprofits to promote local initiatives, such as the GMO crop cultivation ban effort underway in Lane County, Oregon, and Initiative 735 in Washington state for a resolution urging the federal proposal of a constitutional amendment to abolish the doctrines of "corporate constitutional rights" and "money equals speech." Thousands of educational brochures about GMOs and postcards informing people of the Kellogg’s boycott were distributed in all the cities during the July Midwestern and East Coast tour. The nonprofit anticipates a similar reception for the West Coast tour leg, which includes stops in Montana, Washington, Oregon, California, Nevada, and Vancouver, Canada. “The public response during the July tour was overwhelmingly positive. We imagined there would be more resistance to the information we were distributing in the Midwestern GMO agriculture belt. But what we found was strong support. There was only one incident in Lincoln, Nebraska - I was approached by a Dekalb (Monsanto brand) salesman who taunted me, proudly proclaiming that GMOs and toxic chemicals ‘are feeding the world’. But he couldn’t cite any evidence to back up his claim when pressed. He just kept repeating ‘GMOs are feeding the world’ over and over, like a robot. These poison pushers need to be called out when they lie and attempt to deceive the public. Neil had the courage to record an unreserved album about the most pressing issues in this country and on this planet. There is too much at stake today to be silent or passive,” says Luan Van Le, GMO Free USA Communications Director. “The Monsanto Years are here and we are living them. Monsanto is the poster-child for what is wrong with corporate controlled government in our world. The Monsanto Years encompasses several associated subjects that millions of people worldwide are concerned about and active in. Earth is not ours. We are of the Earth. That's how I feel. When we plunder our own home we hurt our children and their children after them. I feel responsible,” says Young. The Activist Village adds a festive and complementary element to the tour for Neil Young + Promise of the Real's new album. The media are encouraged to attend and to report on the concerns of engaged citizens.